New Delhi: Andhra Pradesh MedTech Zone, India’s first exclusive medical device manufacturing park is the result of MoU signed between the state government and Association of Indian Medical Devices Industry (AiMeD) nine months back with a view to promote manufacturing of hi-tech and high-end medical devices within the country. The aim is to encourage domestic manufacturing, reduce India’s humungous import dependency in medical devices, generate quality employment and bring down overall healthcare cost for average citizen. The exclusive tech zone will have the state-of-the-art and the best global facilities for R&D, manufacturing, testing, export & regulatory facilitations and logistics. The Foundation Stone of the 270-acre exclusive manufacturing park was laid on August 19, 2016 at Nadupur village of Pedda Gantyada Mandal in Vishakhapatnam by Andhra Pradesh Chief Minister Mr Chandrababu Naidu in the presence of Union Ministers Mr Venkaih Naidu, Mr Ananth Kumar, Andhra Health Minister Mr Kameini Srinivas, WHO Representative Mr Henk Benkedam, representatives of Indian medical device industry including Mr Rajiv Nath and a galaxy of other notable personalities. “The launch of AMTZ is the dawn of a new era in the history of Medical Devices and Electronic industry in India. We at AiMeD are extremely happy that our efforts have fructified into this momentous occasion. We profusely thank Shri Chandrababu Naidu and Central Government for sharing our vision and wishing India to be among the top 5 medical device manufacturing hubs of the world. We at AiMeD applaud Mr Naidu’s leadership and his teams for taking steps to turn this into a reality within 9 months of our initial discussions with him last November,” said Mr Rajiv Nath, Forum Coordinator, AiMeD. “Medical device manufacturing could be the next big thing for Indian economy after the IT revolution. This facility is not only a big milestone for the country which will catapult India into the league of top medical equipment producing countries in the world but equally important it will help bring down overall healthcare cost while ensuring tremendous saving in terms of foreign exchange,” pointed out Mr Nath. 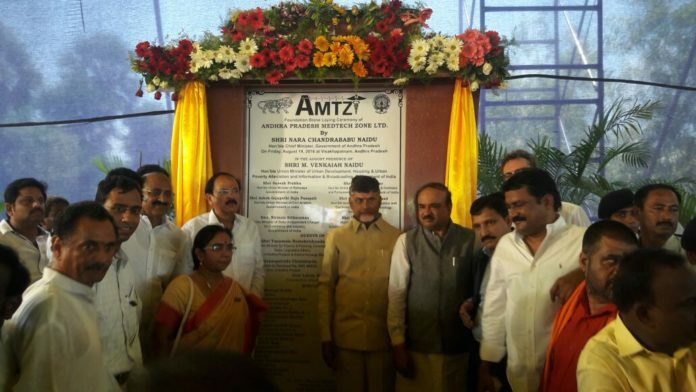 The presence of a galaxy of Union Ministers and State Ministers from Andhra, Senior Officials and who’s who from the medical device industry indicates the support AMTZ and medical devices industry has drawn.